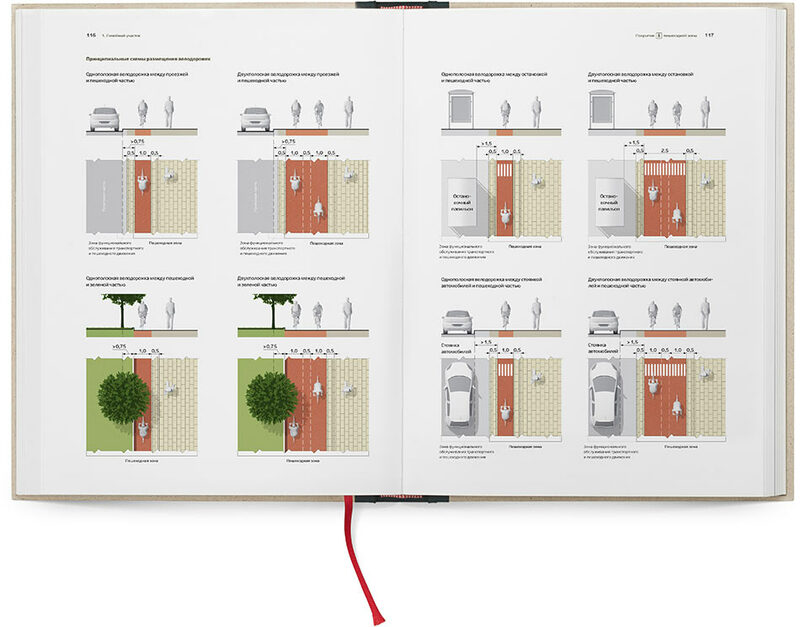 Task: to design a guide on improvement of Moscow streets that would set an example. Outbound routes are streets that connect the center of Moscow with major external highways leading to other cities. Apart from car traffic, radial avenues provide for pedestrian transportation: they accommodate public transportation stops, major city objects and parks. In order to increase the comfort and safety of outbound routes, state enterprise GlavAPU has developed standards for their improvement that will be used for planning new streets and renovating existing ones. 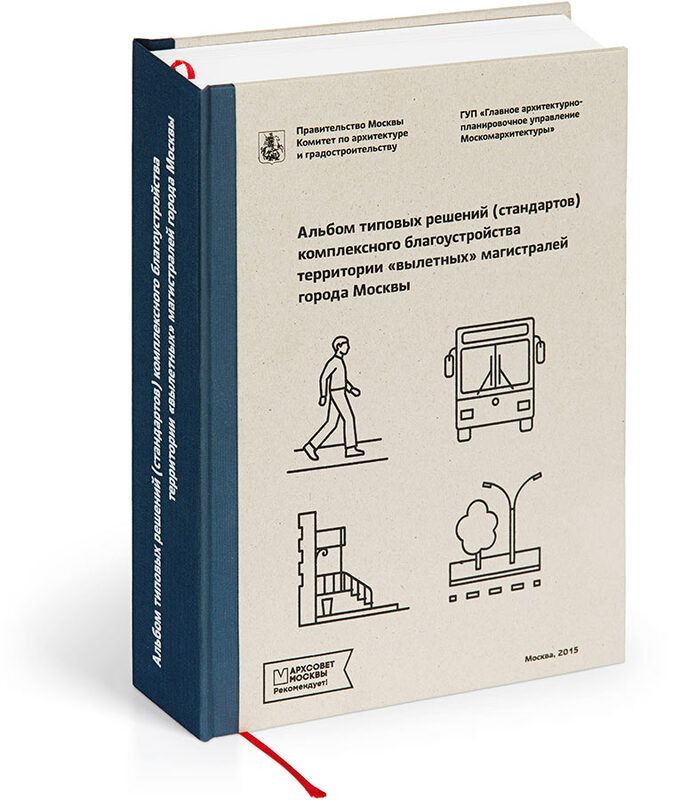 An album presenting standardized solutions for improvement of outbound routes in Moscow was diligently created at the studio. 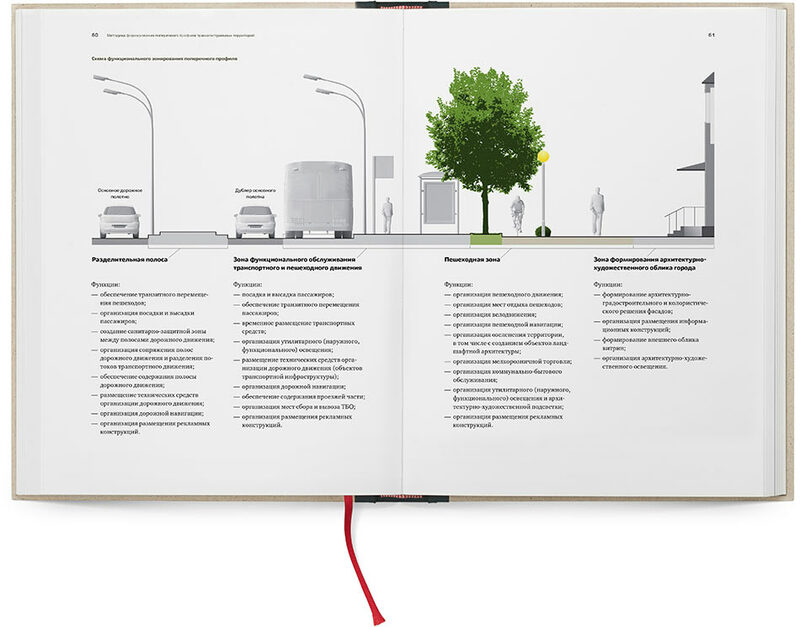 Five types of functional planning sections are distinguished on outbound routes depending on their purpose and patterns of use. 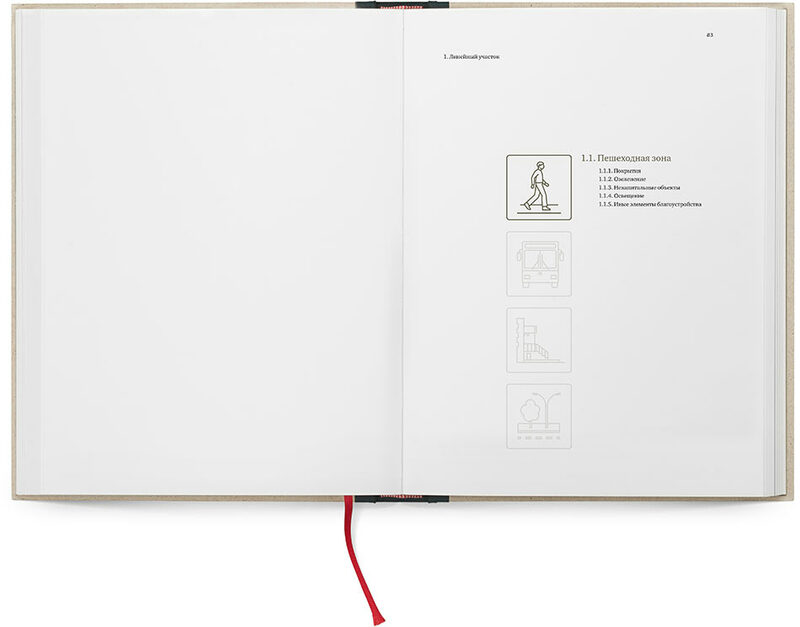 Each chapter is dedicated to one of the types. 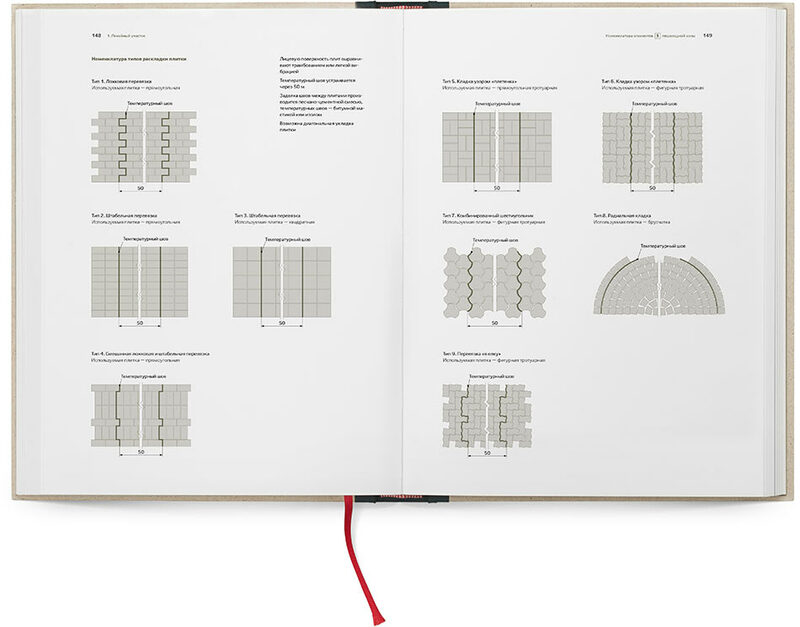 Each section is further subdivided into zones based on the functions they perform. 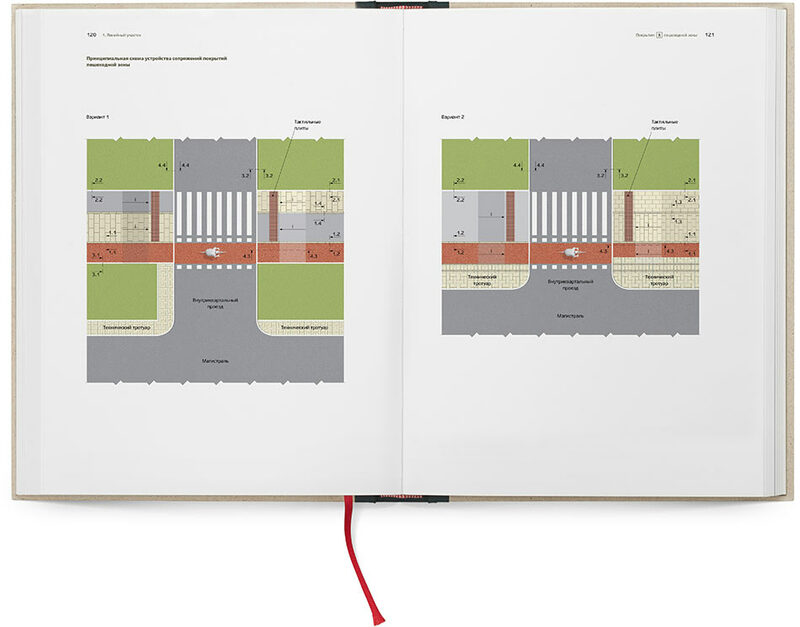 Sections can include pedestrian zones, traffic maintenance zones, skyline shaping zones and dividing strips. Development of the standards involved analyzing the existing issues and suggesting relevant improvements. 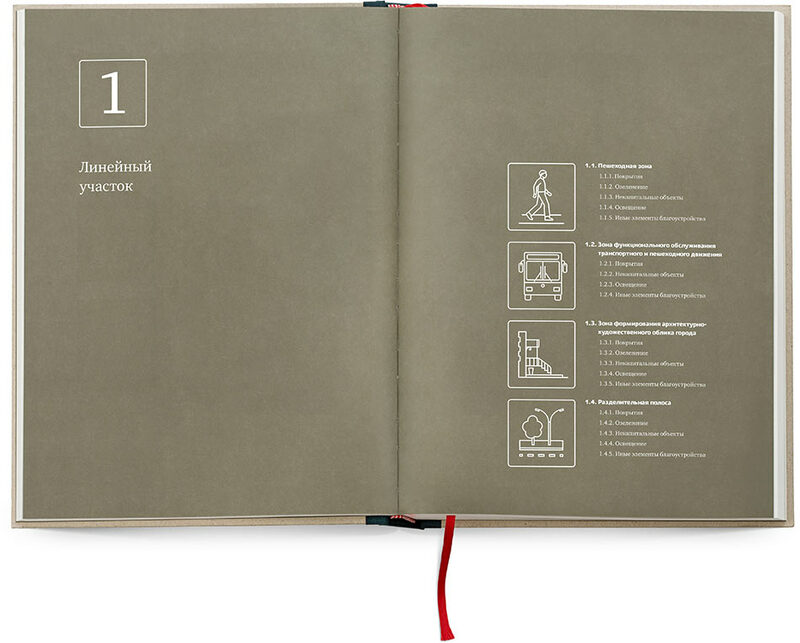 Rules and recommendations are illustrated with informative diagrams. 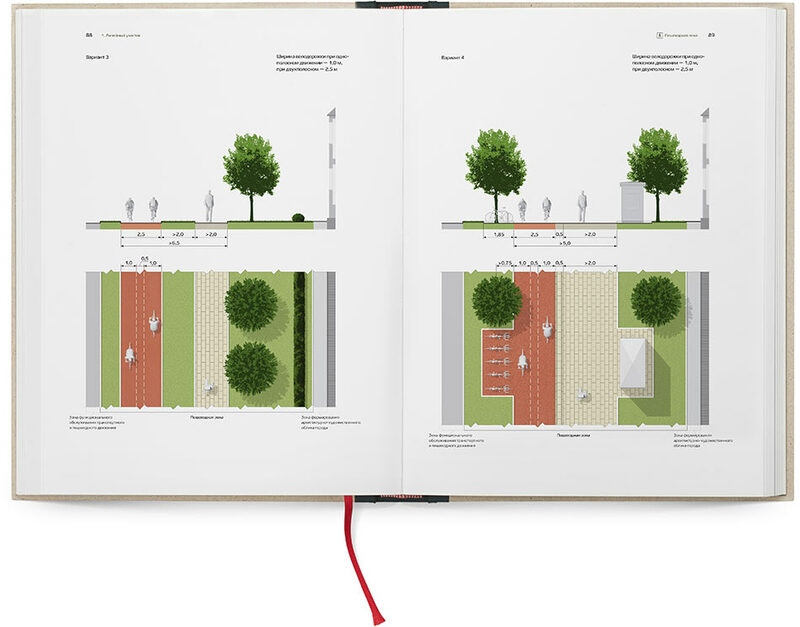 Rules for paving, planting of greenery, lighting, placing of auxiliary and other objects are provided for each zone. 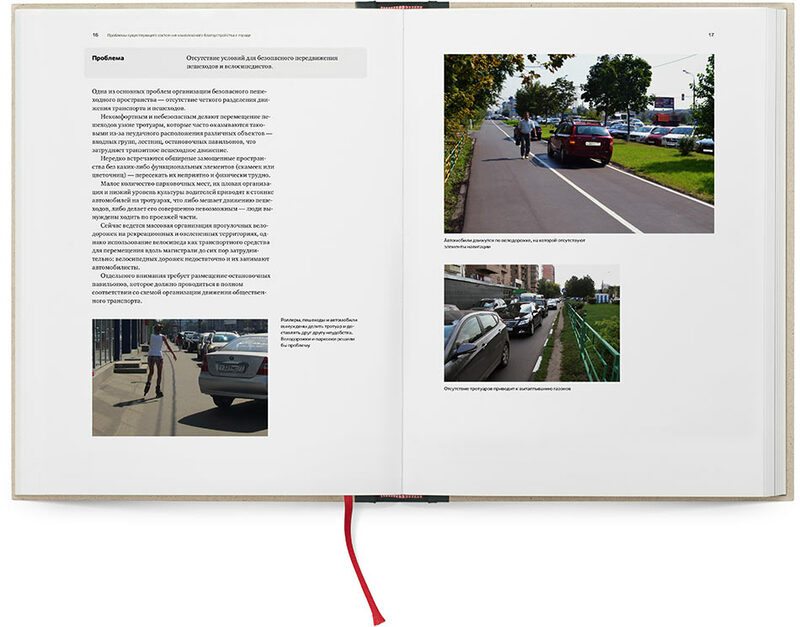 The album includes information on various types of pavement and paving patterns. 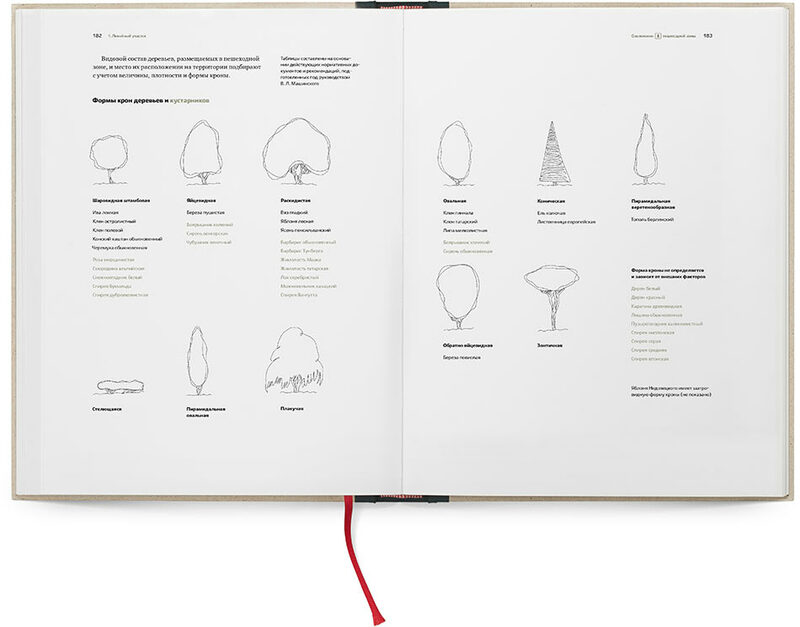 Sections devoted to greenery contain recommendations on selecting and planting trees, shrubs, lawns as well as their classification. 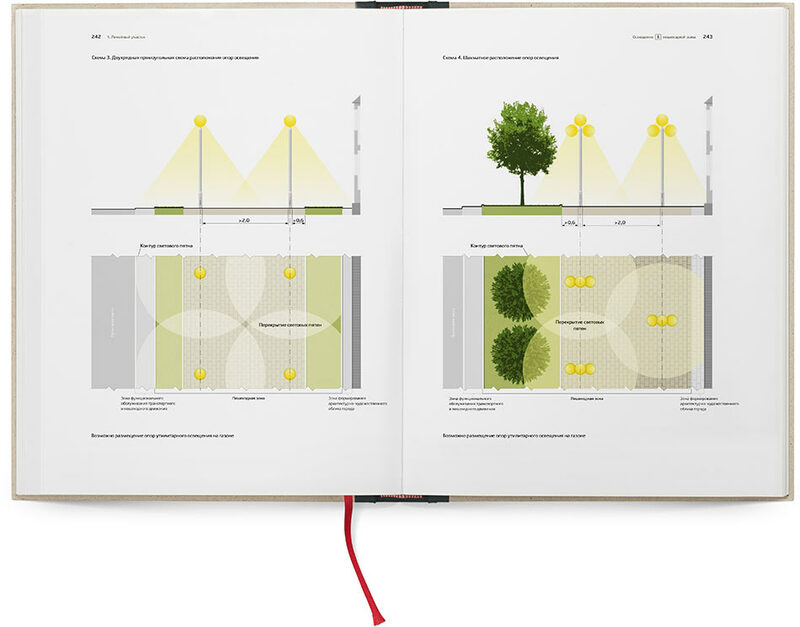 Principles for lighting arrangement are illustrated with detailed plans. 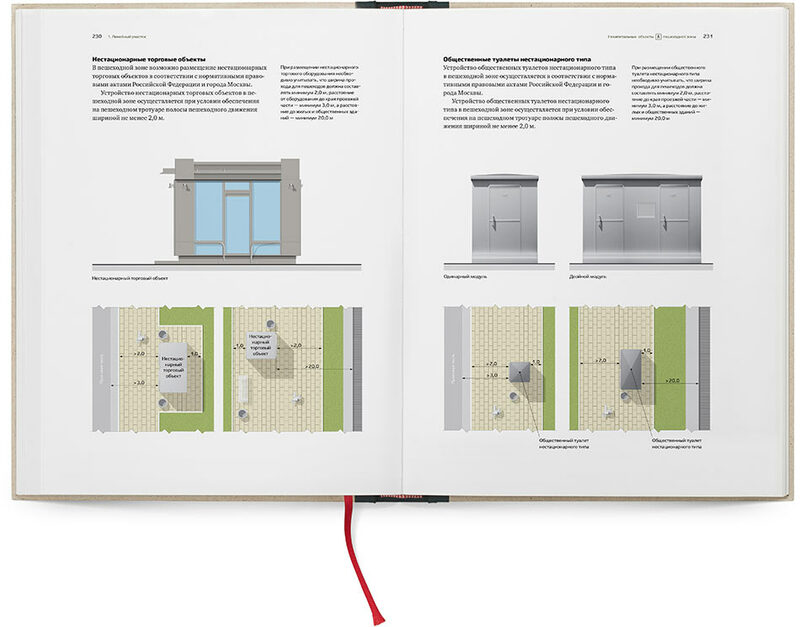 Principles for placement of auxiliary objects—benches, trash cans, fencing, trade pavilions, toilets, ticket kiosks—are covered separately. 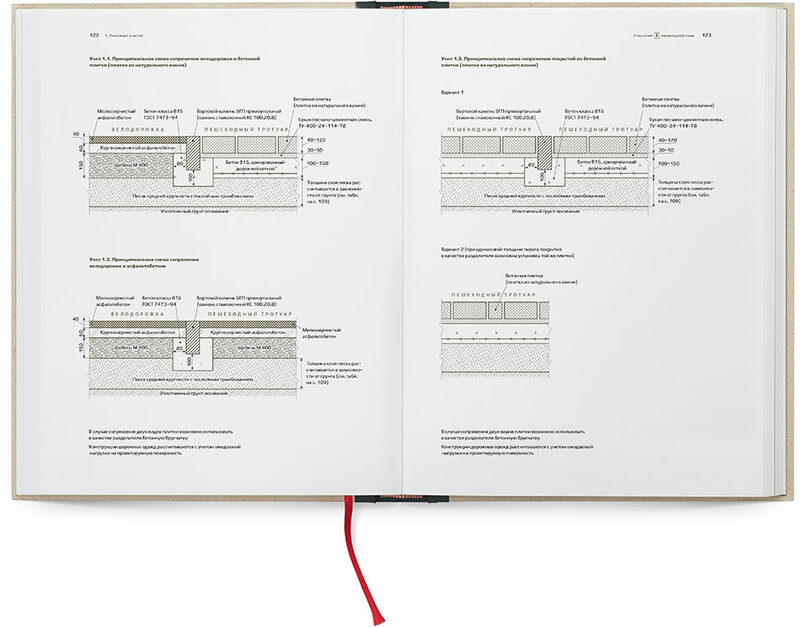 The album is intended for investors, city planners and university students. With participation of: T. Guk, Y. Frolova, O. Vilken, Y. Zancheva.